If you always put limits on everything you do, physical and anything else, it will spread into your work and into your life. There are no limits. There are only plateaus, and you must not stay there, you must go beyond them. We’re happy you're here and want to prepare you to have the most positive experience with us possible. These first classes are where it all begins. This is where you learn your most fundamental and important skills. The basics are the foundation of the true martial artist. In fact, the hallmark of an expert Black Belt is more about the precision of his or her basic skills under pressure than the sheer number of techniques an individual memorizes. Even more important than the technical skills are the habits developed that will take you to your Black Belt. Just remember everyone has to start somewhere so relax and have fun. 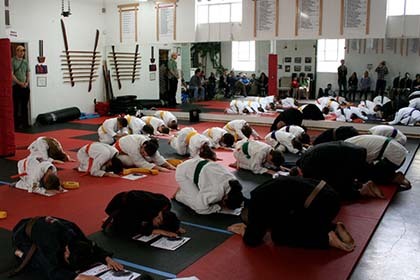 We bow on and off the mat, every time we step on or off. Training is done with bare feet, unless you wear approved mat shoes which are never worn outside. Mats are disinfected frequently, and given a deep cleaning twice a week. We train with controlled contact. The contact is essential to train realistically. The ability to use a technique without hurting your partner is the heart of developing true martial art skills. American Kenpo Karate, from the very beginning, quickly gets to the heart of self defense. Very early on you are taught some crippling lethal moves. However, learning a martial art is deceptively simple. At times it's frustrating: It looks easy - oh, just put my feet like this and move my hands... but when you try it, your hands and feet aren't doing quite what you wanted. At times you may feel clumsy, but that is natural. Some things will come easy, and others you have to work at. Just be patient with yourself and you will get there! Practice is the key. Adaptive teaching means we adapt how we teach for each student. It can be a simple adaptation, say, if you have bad knees, or are healing from an injury, to a more complex adaptation such as our work with those on the Autistic Spectrum. We adapt our teaching methods to work around, and work through any issues. We have instructors on staff trained and educated in working with special needs students. Yes, you can learn a martial arts even with some physical limits. We also use Learning Styles in our teaching. Have you ever had an instructor get frustrated with you for not learning the way they are teaching? We're aware that not everyone learns the same way. If you're having trouble understanding a concept, we change how we teach so that you can best learn it. Visual, kinesthetic, auditory or combined, our instructor meetings ensure that all our instructors are up to date. During Adult Group Class, the belt is worn to the left for men, to the right for women. The instructor(s) belt is centered. Gi's must be clean and free of stains and odors. School patches must be worn. The school crest is placed on the members left. The Universal Symbol and Instructor patches are worn on the left sleeve. The Tiger/Dragon Yin Yang is worn on the right sleeve. Other patches may be placed as you choose, as appropriate. Your belt is symbolic of your knowledge, it must be treated with care and respect. Do not wash it, and don't allow it to drag on the floor. Controlled contact is the most realistic and safe way to train with others. In classes, you will use controlled punches, kicks and techniques on a partner. The key is to come as close as possible without harming. We use absolute care with eyes, neck and knees, and controlled striking with body, leg and arms. The ability to control your body absolutely is what it means to be a martial artist. Practice every technique you are shown until it feels natural, and then some. Find time to work on your Kenpo away from the studio. If there is a particular move that gives you trouble, work on just that move, and then work it back in until it all works together. Think about what other techniques could work for that situation or attack, and see how those different techniques relate or differ.